Cara Bossom and Indica Watson star in DEEP STATE as “Chloe + Lola Easton,” Max and Ana’s children. They have spent all of their previously uncomplicated lives in the Pyrenees. They adore their father and love their mother. Chloe (9) is smart and stubborn. Lola (7) is fun and, more often than not, in her own dream world. Cara Bossom’s stage credits include Macbeth, A Midsummer Night’s Dream and Toad of Toad Hall. She also featured in RADA’s ballet performance of The Nutcracker. Deep State is Cara’s debut television appearance. Indica Watson had her acting debut in the 2015 short film Who Are You? by Chris Blaine and Ben Blaine. Her first television appearance was in the second series of BBC’s The Missing. 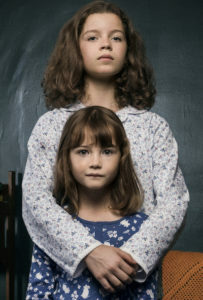 In 2017, she played the young Eurus Holmes opposite Benedict Cumberbatch in the series 4 finale of Sherlock.